Hearts captain Christophe Berra has accused Kyle Lafferty of lacking "class" after claiming his former team-mate went overboard with his celebrations at the end of Rangers' victory at Tynecastle. Goals from Connor Goldson and Alfredo Morelos saw Rangers overtake Celtic to go top of the Ladbrokes Premiership with a 2-1 win. Berra, who was making his first appearance after four months out with a serious hamstring injury, felt substitute Lafferty should have toned down his reaction to the win with respect to the support boss Craig Levein and chairwoman Ann Budge had given to him during his battle with gambling addiction. He had to be dragged away from a potential confrontation with the Northern Irishman by Rangers goalkeeper Allan McGregor but had his say after the match. Berra said: "Kyle is a great lad and I've got no problem with him - but he's just got to remember what this club did for him. "Don't get me wrong, Rangers pay his wages. It was just heat of the moment, he was away celebrating. I just thought he could have shown a bit of class. Just remember that it was these fans who got him that move. "It was just heat of the moment, I was just angry at losing. He's a good lad and I don't have a bad word to say of him." Levein is certain to face disciplinary action from Scottish Football Association compliance officer Clare Whyte after his astonishing rant against referee Bobby Madden's "abysmal" performance. The Hearts boss was astonished to see Morelos escape punishment following a number of run-ins with Berra and the defender agreed, saying: "I'm sure he must have eyes in the back of his head because every goal-kick, he wasn't looking at the ball, he was looking at me. "I know it's a tough job. And I like the physical battle. It doesn't bother me. 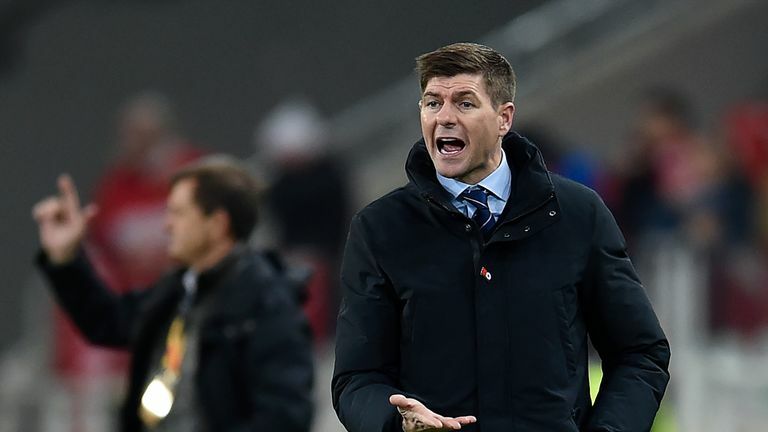 But when you do it five, six, seven times..."
While Hearts were left raging with Madden's display, Gerrard was overjoyed with the victory that puts his team top of the pile. Gerrard said: "Being in first place means nothing to me and I'm not lying. It is fantastic for the fans as it has been too long. "We have worked hard to get there, but it is a challenge for us to see how long we can stay there. People have games in hand and will breathe down our neck, but it is a different responsibility. "The players know that and we have to handle that. There is no point getting carried away, because we are in early December and you get nothing for it right now."